After years of leggings reigning as women's number one choice of "pants," denim is back and better than ever. Over the last year, we've seen every style of denim make a comeback – from mom jeans, to distressed denim, to high rise and light washes. I only wear jeans, and I'm always looking for a new and interesting pair to add to my wardrobe. The latest trend is denim with stripes down the side – a fun, sporty take on your everyday denim. Keep reading to find my favorite affordable options and some inspiration of how to style this new trend. 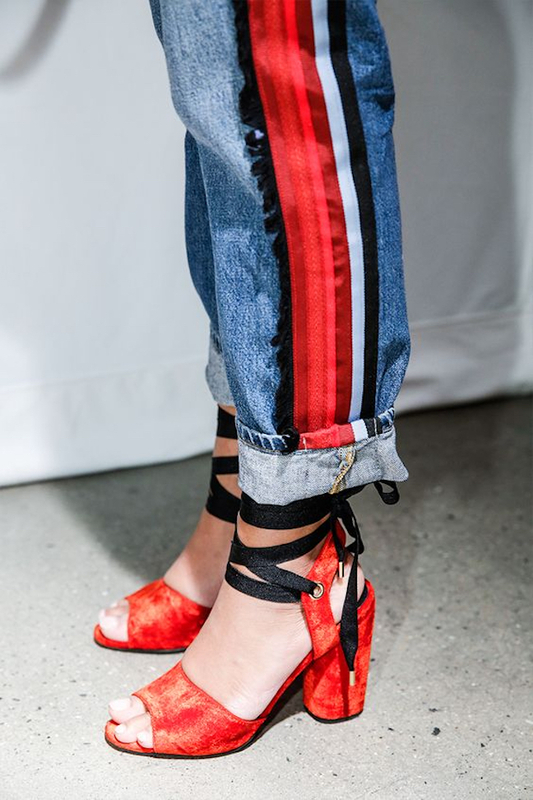 I first noticed this trend when Danielle Bernstein of WeWoreWhat had a collaboration earlier this year with Bloomingdales and 7 For All Mankind. When she released these jeans with the brand, I instantly fell in love. Unfortunately, her items were way out of my price range but thankfully, since the trend has really taken off, every major brand has a version of this denim for much cheaper. What I love most about this style of denim is their diversity. When I first saw them, I figured they were too sporty and would limit what I could pair with them. However, now that literally everyone has been spotted in this new style, I realized I was sooo wrong. You can dress these jeans up and down, for a day of errands like Stella Maxwell in the picture above, or for a dinner date with heeled booties, a beautiful blouse and leather jacket. Beyond being both a new style and very cute, the style also elongates your legs. At only 5 foot 3, I'm always looking for something that makes me look taller. Sometimes, even high waisted jeans don't help to make my legs look longer, but the lines on the side of these jeans totally create the illusion of longer and thinner legs. I have this pair from Zara – they are super affordable and comfy. No matter what wash, fit, or waist height you are looking for, I linked the perfect pair of striped jeans for you. Let me know what you think of this trend in the comments!